Questions on Indian Constitution with Answers: Multiple choice questions (MCQs) based on Indian Constitution and Policies are asked in various examinations like RAS, IAS, IES, IRS and SSC conducted by RPSC, UPSC and other state level PSCs. Here is collection of top 100 Frequently asked Questions from Indian Constitution and Policies as part of RasExam.com QUIZ TIME. 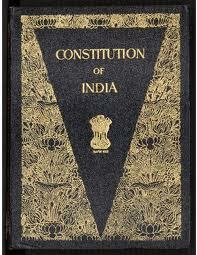 For readers who want to explore more on Constitution can refer or 7th July 2011 Article which contains Full Constitution of India in Hindi and English in PDF Download format. 3. Which one of the following Articles empowers the President to Appoint Prime Minister of India ? 6. Which of the following exercised the most profound influence in framing the Indian Constitution ? 7. In which article of the Constitution of India has the Joint Sitting of the Lok Sabha and the Rajya Sabha been provided ? A. To lay down financial policies of Union govt. 23. Who decides whether a bill is a Money Bill or Not ? Which one of these statements are correct ? 25. Who among the following did not serve as the Vice president before becoming president of India ? 27. Which writ is issued by a High Court or the Supreme Court to compel an authority to perform a function that it was not performing ? 30. In which case did the Supreme Court of India determine that the Parliament has power to make amendment in fundamental rights, but it cannot make any change in the basic structure of the Constitution ? 32. Which of the following political parties was first de-recognized and later on again recognized as a National Party by Election Commission of India ? 35. Which of the following amendments in the Constitution of India are related with the institution of "Panchayat Raj"? 36. The first Five-Year Plan in India was launched in the year? 37. Who is the Chief Law Officer of India ? 38. Who prepared the first draft Constitution of India ? 39. Who was the Chairman of the Draft Committee of the Constituent Assembly ? 40. When did Constituent Assembly adopt a national Flag ? 41. Who was the last British Governor General who addressed the Constituent Assembly ? 42. When was the Constitution of India adopted by the Constituent Assembly ? 43. In the Parliament of India Upper House in known as ? 44. In the National Flag, what does saffron colour represent ? 45. In the National Flag, which colour is used in the wheel ? 46. Chief Election Commissioner of India holds office for a period of ? 49. Which of the following bills cannot be introduced first in the Rajya Sabha? 51. first state in India which was created on linguistic basis ? 52. During which Five Year Plan was Green Revolution initiated in India? 55. Which law officer shall have the right to speak in both the Houses of Parliament ? 56. Which Article of the Constitution of India mentioned the posts of the Chairman and Deputy Chairman of Rajya Sabha ? 57. In which session of Parliament, Railway and General Budgets are presented ? 58. Where wards Committees are found ? 59. Who has the Authority to approve President Rule in the state ? 62. How many members are nominated to the Rajya-Sabha ? 63. The judges of the High court of a state are appointed by ? 64. According to Which articles of the Indian Constitution is Hindi, In devnagari script the official language of the Union ? 65. Which constitutional article provides personal immunity to the head of the states for his official act from legal action, including proceedings for contempt of Court ? 66. Under which Constitutional Article, Union Government has the power to give direction to the State Govt. regarding any of the provisions of the Constitution ? 67. What is the meaning of Foreign State as given in our Indian Constitution ? 68. Who decides allotment of symbols to Political Parties ? 69. Who decides de-recognition of the Political Party solely on the basis of its performance at the election, e.g., bycotting of the election ? 70. After declaration of financial emergency by the President, what is the period of operation without approval by the Parliament ? 71. Before the independence of India, Dadra and nagar haveli were under the administrative control of ? 72. Who among the following was the first chief Justice of India and assumed office on 26th Jan. 1950 ? 73. Which Constitutional Article lays down the provision for a National Commission for SC and ST ? 74. Which community gets special provision for Central Services in Article 336 ? 75. National Commission for SC and ST shall be made by which constitutional institution ? 76. Under Constitutional Article 343, which is the official language of the Union ? 77. Which Constitutional Article defines the Panchayat Raj ? 78. Which Constitutional Article define `Municipalities' ? 79. The Constitution of India, was drafted and enacted in which language ? 88. For the members of parliament in India, who determines the salaries and allowances from time to time ? governing institutions was accorded ? 90. In India when both Offices of President and Vice-President happen to be vacant simultaneously who will discharge the duties of the President ? 91. As per constitution of India, the Legislative assembly of a state consists of more than 500 and not less than 60 members, but which one of the following states has 32 Members ? 93. Under whose direct supervision is the Lok sabha secretariat ? 94. How many members can be nominated to the rajya sabha by president of India ? 95. Who of the following is the chairman of the National Water resources council ? 96. Who is the chairmen of National Integration Council ? 97. Which one of the following dealt with the subject of Local self Government ? 98. Which one of the following is not a fundamental right ? 99. Which one is known as Lower House ? 100. Under the panchayati Raj system Gram sabha consist of ? It seems answer to question no 29 and 64 are wrong posted in this post, their correct answers in my opinion are Deputy speaker of lok sabha and article 343. Thanks for suggestions.. You are correct, Changes done. alot ..keep adding more THANK YOU ..
thank you so very much. . . . very helpful. . .hope you can provide some more in pdf format. . .